Directed by Nietzchka Keene. Iceland, 1990. Set in medieval Iceland, The Juniper Tree follows Margit (Björk in a riveting performance) and her older sister Katla (Bryndis Petra Bragadottir) as they flee for safety after their mother is burned to death for witchcraft. Finding shelter and protection with Johan (Valdimar Orn Fygenring) and his resentful young son, Jonas (Geirlaug Sunna Pormar), the sisters help form an impromptu family unit that’s soon strained by Katla’s burgeoning sorcery. 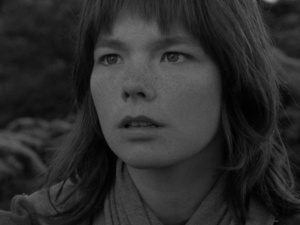 Photographed entirely on location in the stunning landscapes of Iceland in spectacular black-and-white by Randy Sellars, The Juniper Treeis a deeply atmospheric film, evocative of Carl Theodor Dreyer’s Day of Wrath and Ingmar Bergman’s The Virgin Spring, and filled with indelible waking dream sequences (courtesy of legendary experimental filmmaker Pat O’Neill). A potent allegory for misogyny and its attendant tragedies, The Juniper Tree is a major rediscovery for art house audiences. The Juniper Tree was restored in 2018 by the Wisconsin Center for Film and Theater Research and The Film Foundation, with funding provided by the George Lucas Family Foundation.